Jasbir K. Puar. The Right to Maim: Debility, Capacity, Disability. Durham, N.C.: Duke University Press, 2017. 296 pp. 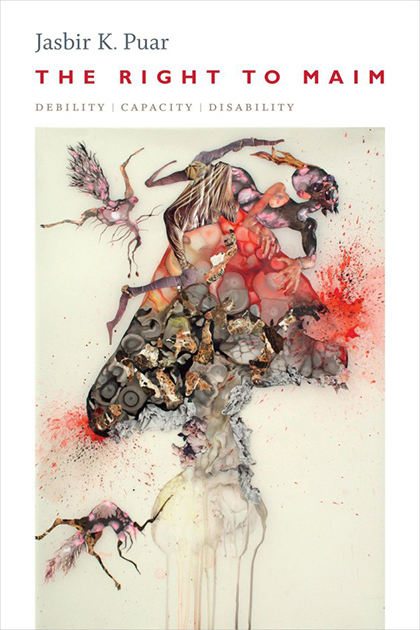 Jasbir Puar’s new book The Right to Maim: Debility, Capacity, Disability serves an important position in the panoply of books and articles about disability. Puar steadfastly reminds us that in considering various kinds of debility we need to keep a broad horizon concerning the interrelation among race, gender, war, work, and all the harms that these categories embody. Similarly, she focuses on the global and reminds us that individual national solutions are inadequate to getting the full scope of injury. In so doing, she posits a new biopolitical concept—the right to maim. Along with Foucault’s emphasis on biopolitics as the power to keep alive and Achille Mbembe’s thanatopolitics, the right to maim looks at precarious populations, including African Americans in the US and Palestinians under Israeli jurisdiction, and specifies how they are contained and oppressed by this right to maim. As with her earlier book Terrorist Assemblages (2007), Puar relies on the work of Gilles Deleuze and Félix Guattari to develop her various concepts. One concept in particular is what she sees as the mechanism by which debility and capacity are employed by neoliberalism to create a kind of machine for producing and maintaining precarious populations. Puar objects to the idea that disability is an individual identity because that would create a stalled moment in the oscillation between debility and capacity. She likewise objects to the social model of disability, which sees the political, social, and physical surround as the cause of disability, because that too would freeze-frame the complex mechanism she discusses. It therefore follows, for her, that the US disability activist movement, while admirable for its engagement, has missed the point that it is capitalism that has created the need for these precarious populations and that efforts like the ADA therefore only immerse disabled people further into the mechanism that created their debility in the first place. One wonders, at times, whether the Deleuzian mechanisms used in the book are themselves too broad, encompassing, and cumbersome to describe, let alone remedy, the problems raised. Puar positions herself as the exacting critic of not just neoliberalism but various brands of feminism, race and disability activism, and the foreign policy of various countries. While a reader can be an ally with her on many of these issues, it is difficult to occupy the “ruthless criticism of everything existing” as Marx puts it. Many in the disability community may find the book unreadable and the insights difficult to put into practice. But it is nevertheless a book that needs to be considered in rethinking the future direction of disability studies. Karl Marx, “For a Ruthless Criticism of Everything Existing (Marx to Arnold Ruge),” trans. Ronald Rogowski, in The Marx-Engels Reader, trans. Rogowski et al., ed. Robert C. Tucker (Princeton, N.J., 1978), p. 13.